Neil Robertson completed a 10-6 defeat of Mark Allen to earn a place in the Coral Tour Championship final in Llandudno. The win sees Australia’s Robertson reach his third straight ranking final and the 25th of his career. He will take on Ronnie O’Sullivan for the £150,000 top prize. The best of 25-frame clash will take place over three sessions on Saturday and Sunday. The winner will be guaranteed to take home the Coral Cup, which is awarded to the player who earns the most money across the three Coral Series events. Robertson will be hoping to cap a memorable week with silverware on Sunday evening. He celebrated the birth of his second child with fiancee Mille last weekend, a girl called Penelope. The Thunder from Down Under has now ended a four-game losing streak against Allen, which included defeat in this season’s International Championship final. Robertson now leads the Northern Irishman 10-7 in their head-to-head record. 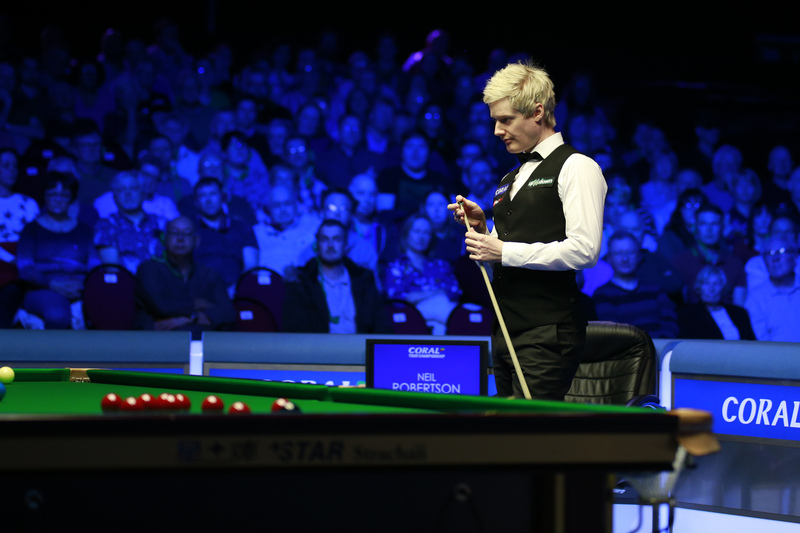 Robertson, who has claimed titles at the Welsh Open and Riga Masters this season, grasped the early initiative this afternoon by emerging from the session 5-3 ahead. The match turned back in the direction of Allen as the action recommenced this evening. He took the opening frame with a break of 77. Robertson responded to make it 6-3, but it was Allen who forced his way back to parity at the mid-session. The Pistol fired in breaks of 82 and 103 on his way to claiming three frames in a row and making it 6-6. When they returned the pendulum swung once more and Robertson assumed control of proceedings. This time it was a match winning streak, as he took four frames in a row with breaks 106, 87 and 52 to progress and book another final with O’Sullivan. He will be hoping to fare better this time after suffering defeat at the hands of the Rocket in the Coral Players Championship final. “I really got motoring to have a good lead going into tonight. I won the first frame this evening then I just lost my focus,” said Robertson. “I had to tell myself to concentrate harder. I was still playing well and I felt really good. It was just maintaining my focus when I got in the balls. “This is my fifth final this season and I’ve never done that before. Ronnie got the better of me last time. Hopefully I can improve my efforts and get the better of him in a best out of 25 frame match, which will be very exciting to play in.